On November 23, 2018, the U.S. Global Change Research Program (USGCRP) released Part 2 of the Fourth National Climate Assessment as required by law. [link to report] You may have read in the always credulous “mainstream” media about all the doom and gloom prophecies in the new report. Part 1 was released last November. Much of the latest USGCRP report is vague and unsubstantiated. It is really a political report rather than a science report. It offers no hard evidence, just vague assertions and claims that past climate change is no evidence about future climate change. 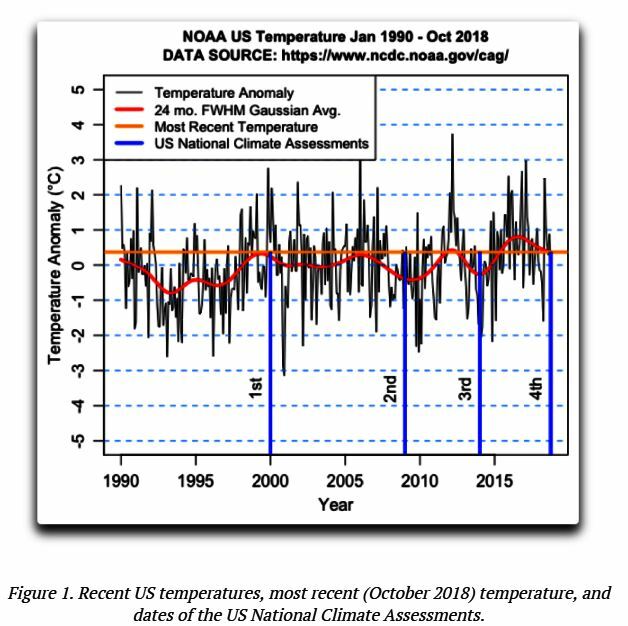 It does not meet the standards of the Information Quality Act, and each page should be stamped: “Based on speculation, not hard evidence.” Part 2 is based almost entirely on one extreme climate model, Representative Concentration Pathway 8.5, (RCP8.5) which is an outlier from most other models. Even the UN’s IPCC is phasing out that model. The scaremongers have a problem. Since the first National Climate Assessment in 2000, U.S. temperatures show no net change. Nature is not cooperating with the political narrative. The National Climate Assessment stresses that this report “was created to inform policy-makers and makes no specific recommendations on how to remedy the problem.” Yet the takeaway was clear: The costs of action (10 percent of America’s GDP) dwarf the costs of any climate policy. “The scientists who wrote the National Climate Assessment used unreliable information that exaggerates the risks global warming poses.” – University of Colorado Prof. Roger Pielke Jr.
By the way: According to the U.S. Energy Information Administration, between 2005 and 2017, U.S. energy related emissions of carbon dioxide plunged by 861 million metric tons, a 14% drop due mainly to the fracking revolution. During the same period, global emissions rose by 21% due mostly to China and India economic development. Posted in Miscellaneous Stories and tagged climate, extreme weather, global warming, sea level, wildfire on December 3, 2018 by wryheat2.